If you’re reading this, then you likely listen to Pop Culture Happy Hour, the NPR pop-culture roundtable podcast on which I appear every week. Regardless of how you got here, thank you — for visiting, for listening, for reading, and for helping fuel the engine of enthusiasm that keeps our labor of love alive. In honor of PCHH’s second anniversary, we’re resuscitating the little social-media holiday I created last year, Appreciation Day, in which folks set aside a bit of time and use social media to praise the people they like and care about. But I also wanted to pass along a little gift in honor of the occasion. 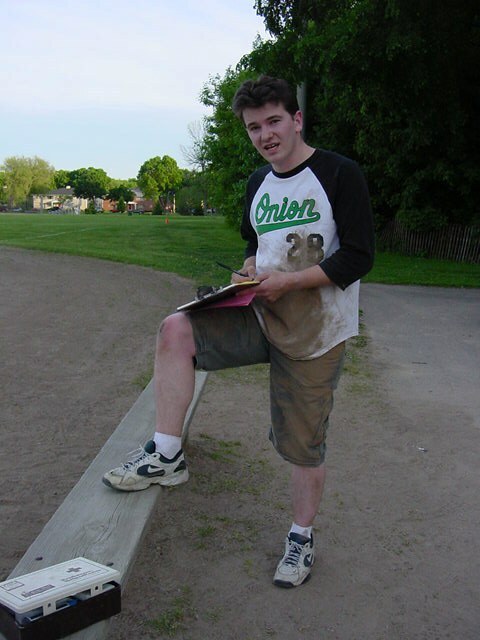 A few years ago, I cobbled together a 6,400-word essay about the six years I spent as coach and co-captain of Team Onion Softball, the mostly hapless softball-playing apparatus of the humor website bearing its name. I’d originally planned the piece as a chapter in a book of essays, most likely written in collaboration with my dearest friend, PCHH host Linda Holmes. But, given that I’m on pace to complete said book around the year 3850, I thought it better to simply give the essay to listeners as a way of 1) getting it out there; and 2) thanking those who’ve been so vocal in their support of the show. Obviously, since no one actually asked for it, this is a gift of the “no strings attached” variety — by all means, please download it and enjoy it. But if you do feel inclined to offer something in return, I’d be eternally grateful if you’d please tell your friends: Send them this link, tell them about Pop Culture Happy Hour, direct them to “like” our Facebook page (and do so yourself, if you haven’t already), and so on. Those small gestures of support are vital to the show, and I can’t tell you how much we all appreciate them.